Democratic House Speaker Mark Eves of North Berwick speaks during a Thursday press conference at Cony High School in Augusta, where he and other Democratic leaders unveiled a tax reform proposal to compete with Gov. Paul LePage's. Republican legislative leaders discuss their reaction to a Democratic tax reform proposal during a press conference on Thursday at the State House in Augusta. From left are Assistant House Minority Leader Ellie Espling, R-New Gloucester; House Minority Ken Fredette, R-Newport; Senate President Mike Thibodeau, R-Winterport; Senate Majority Leader Garrett Mason, R-Lisbon, and Assistant Senate Majority Leader Andre Cushing, R-Hampden. AUGUSTA, Maine — Democratic legislative leaders fired a shot directly at Gov. Paul LePage’s tax reform proposal Thursday with the release of their own plan, which includes lower income tax cuts than the governor proposes but is more aggressive in its effort to soften Mainers’ property tax burden. Brent Littlefield, LePage’s chief political strategist, said anything that veers away from LePage’s plan defies the will of the voters, who in November elected the Republican to a second term. The Democrats’ unveiling of the detailed plan, which has been dubbed “A Better Deal for Maine,” shows that their strategy over the next two months will be to supplant LePage’s tax reform proposal with their own as opposed to fighting it piecemeal, as they have with some of LePage’s past proposals. It also shows that Democrats are trying to take the offensive after years of being kept on their heels, politically, by LePage. On the other hand, it acknowledges a victory for LePage in terms of the fact that his call for tax reform appears headed to fruition in some form. House Speaker Mark Eves, D-North Berwick, said a key component of the Democratic plan is that it doesn’t create a revenue hole that will lead to severe cuts in services. Democrats argue that LePage’s plan would do so, but the governor has said reducing Maine’s overall tax burden is essential to lifting the state out of its lengthy economic malaise. LePage’s proposed tax cuts wouldn’t go into full effect until the 2017-18 biennium. That means services will have to be cut in two years because of revenue cuts being proposed now. With support from Republican majorities in the 125th Legislature, LePage shepherded through the largest tax cut in Maine history in 2011. But other tax reform proposals, made up largely of Democratic efforts to expand the sales tax base and Republican efforts to cap taxes or state revenues, have failed during the past decade. 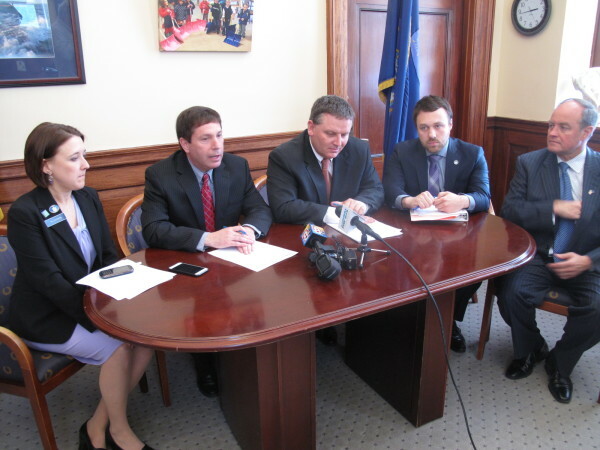 House Minority Leader Ken Fredette, R-Newport, said during a news conference Thursday afternoon that neither the Democratic budget, nor LePage’s, is focused enough on reducing revenues. Asked where he would cut spending, Fredette reiterated the UMaine System but said he also would look to social services provided by the Department of Health and Human Services and state education funding for K-12 public schools. “You can’t look at reductions in expenditures if you’re not looking at those two departments,” he said. Still, the Democrats appear ready to set up a game of political chicken with a governor who relishes confrontation, which in this case could result in a veto of the biennial budget late in this year’s legislative session, which is scheduled to conclude in June. Senate Minority Leader Justin Alfond, D-Portland, said that in addition to providing tax relief for low- and middle-income earners as opposed to the rich, the Democratic proposal is based on the belief that helping Mainers who are already here — as opposed to trying to attract people and businesses to Maine, such as incentives in LePage’s budget seek to do — makes more sense. “The better deal is making an investment,” he said. The prospect of such an impasse already has triggered talk of a state government shutdown, which is what happened in 1991, when Republican Gov. John McKernan butted heads with legislative Democrats over workers compensation system reforms. — Shifting LePage’s proposed income tax cut away from high-income earners decidedly toward taxpayers with lower incomes. — Keeping the sales tax rate at 5.5 percent instead of increasing it to 6.5 percent, as LePage proposes. The Democrats agree with LePage about broadening the number of items subject to the sales tax and creating a tax credit to help offset any increase in the overall sales tax burden for Mainers. — Doubling the homestead exemption for everyone, whereas LePage proposes doubling it for property owners over age 65 and eliminating it for everyone else. They also agree with LePage about instituting a property tax fairness credit. — Keeping the meals tax at 8 percent, instead of reducing it to 6.5 percent, as LePage proposes. The Democrats would move the lodging tax to 8 percent, as would LePage. — Increasing the funding for municipal revenue sharing to $80 million in each of the next two years. 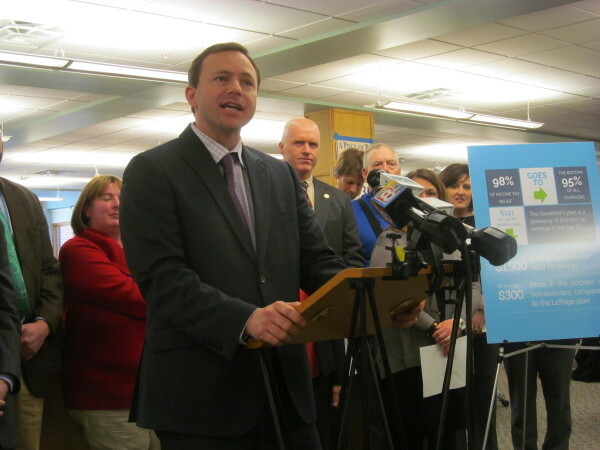 LePage proposes flat funding it at $62 million next year and eliminating it the year after. — Making no changes to the estate tax, which LePage wants to eliminate, and rejecting LePage’s proposal to tax large nonprofit organizations. Democrats said they will not propose a separate budget or tax reform bill to complete with LePage’s, but they would instead try to work their priorities into budget negotiations that will take place at the State House over the next two months. A biennial budget bill must be passed by June 30, which is when the current fiscal year ends. It will have to have the support of two-thirds of the Legislature to take effect on July 1. Correction: A previous version of this article stated incorrectly what Sen. Justin Alfond’s title in the Senate is. He is Senate minority leader.